DR.J (Upgraded) 1800Lumens 4Inch Mini Projector is made to meet customers’ new needs. The latest projector is upgraded to 1800 lumens with 2000:1 contrast ratio. With such profile, it delivers seventy percent brighter picture than the other LED mini projectors. Most importantly, it supports most input methods such as 720P, 1080P HDMI, TV Box and Amazon Fire TV Stick input. This DR.J projector gives you wider scope of entertainment. Because it is compatible with most devices such as ChromeBook, PCs, Laptops, Blue-ray DVD players, USB flash drive, SD card, TV box, Amazon Fire TV Stick, Android Smartphones, iPhones, iPad and media players. This DR. J 4-inch mini projector can be a good multimedia portable device for all your entertainment and business needs. 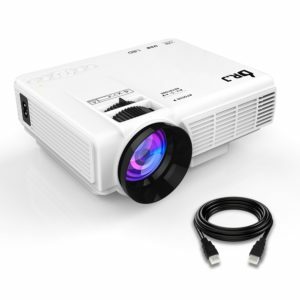 It is a perfect mini projector for home theater, video games and movies as well as PPT presentations. Dr. J 4” projector makes detailed data presentations very easy. You can easily display Excel, PDF and TXT files. Highlights of Dr. J mini projector are 2000:1 contrast ratio, 1800 Lumens, 70% brighter than other LED mini projectors, 840 X 480 native resolutions, 1920 X 1080 supported resolution, 32 to 176 inches viewable size, 4000 hours of lamp life and 4:3/16:9 contrast ratio. I would like to attached to the ceiling so projector is going to be upside down and the image is going to project like that.